The Ulster Covenant of 1912 and the Easter Proclamation of 1916 belong to each other. As Europe fell towards the reckoning of 1914, Ireland learned to broaden its demonstrations of independence. Irishness made more room for louche Anglo-Irish urbanity, and that made the flowering of Gaelic League, Abbey Theatre, and Catholic University all the more exciting. Of course a lot of the people who made much of Irishness had always a bit of Dissenter to them — Wolfe Tone was a Trinity debater, like all the best people. When Ireland started to deploy earnest Anglican church ladies and foppish London-based poets, though, it seemed like it was all over and a resignation set in. The House of Commons, bullied by an Irish National Party that sacrificed gentlemanly convention for cold-eyed manipulation of the numbers, had about conceded Irish independence. The irredentists, the rebels, were the Ulstermen. Like the proudest and most majestic dinosaurs, the fastest Clipper ships, like the strongest fortifications of the Maginot Line, the Ulstermen set about fighting the last war in earnest. They signed the Ulster Covenant in their droves. It’s a message in a bottle from the world before the Great War, and it’s a confused lament of a certain strand of British Protestantism. There’s a surprising embellishment of the initial capital “B”, and a flourish around all of the sentences, which has a touch more of the Books of Kells and Durrow and the old Irish Christian church than the Calvinists might want to credit. There is a lot more King-licking than I’ve ever thought the true Low-Churchers really wanted, and there are the red-ink “red-letter day” paragraph marks which are from the Ussher Bible, so there are influences that are both uniquely Irish and strangely ecumenical. This is a contract that was signed, in a weird pseudolegal context. 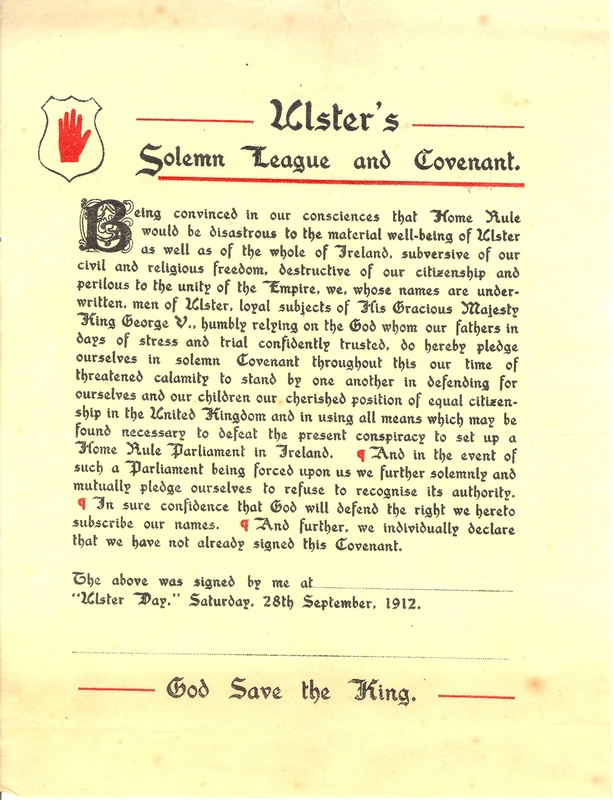 People believed it counted more when it was signed in blood; they queued up to sign; there is even a blank space for your name: “The above was signed by me at ___________, ‘Ulster Day,’ Saturday 28th September, 1912.” It declares for the King, “His Most Gracious Majesty”, and closes with “God Save the King” while frankly threatening armed resistance to his law. Kipling wrote a poem about it. There was a different document, a “Declaration”, for the ladies. Then the Great War. Kipling’s son went — he’d die, unmarked — and the world changed. The Ireland of 1916 was a colder and darker place; we had discovered the carnage and brutality that all of Europe had. Less than four years after the Covenant, the Proclamation was of a different time: For good or ill, now we had disciplined, worldly, uniformed men with guns; we had ideas and ideals and organization and more of an equal engagement in the same sort of politics that applied elsewhere. There is a cowardice tending towards apophasis in the self-congratulatory bluster that often infects the Proclamation, though. The cringe-inducing mention of “our gallant allies in Europe” was a filthy payment for a boatload of rifles; the sheer cattiness of references to “an alien government”. The Proclamation was not signed personally, the way the Covenant was. But, with one exception, those whose signatures are recorded were all executed by firing squad, and so many Covenant-signers marched towards the Somme. 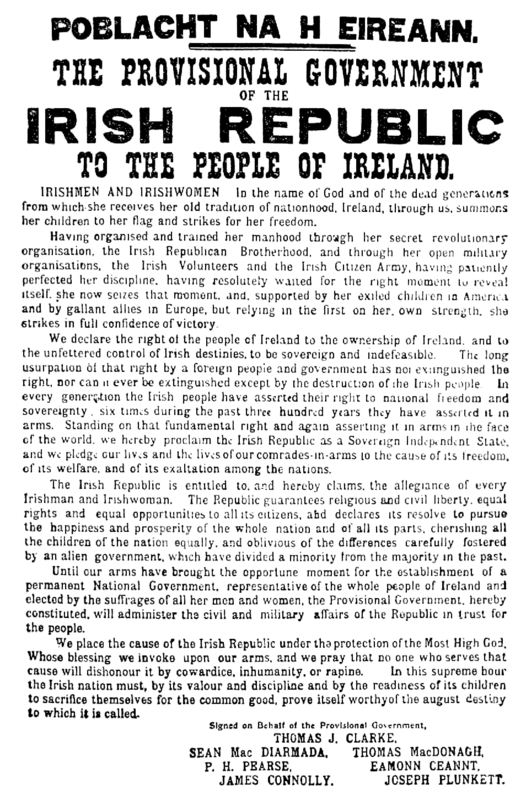 The Proclamation is often pompous, and grandiose — but that’s part of the nature of the Rising, holding the GPO and being a futile gesture. And it’s often tender — the religiosity of the Proclamation is more Thomas Jefferson than archbishop McQuaid: there is the bold promise that “The Republic guarantees religious and civil liberty, equal rights and equal opportunities to all its citizens”. The Ulster Covenant doesn’t do that. In the two documents there’s the frustration of our failure to make a go of it together. Both the Republic and the North are much hurt and much diminished.